From creating your own business to living in the same place you work, millennials are shifting the way we view placemaking and the arts. 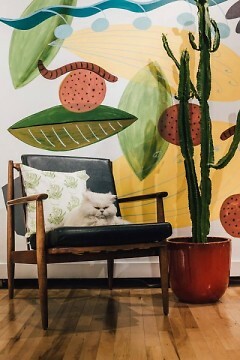 Follow them on Facebook and Instagram, keep updated on their website, and stop in to the shop to say hi to Elton the cat at 317 South Division Ave.
“Home is what you surround yourself with, what is inspiring you, and how you express yourself.”- Erika Townsley, Co-Owner and Curator of Light Gallery + Studio. 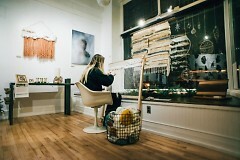 Light Gallery + Studio is a place where community members and artists can utilize space for fine art exhibitions, shop and sell work of all varieties, and host and participate in workshops in the Heartside Neighborhood. 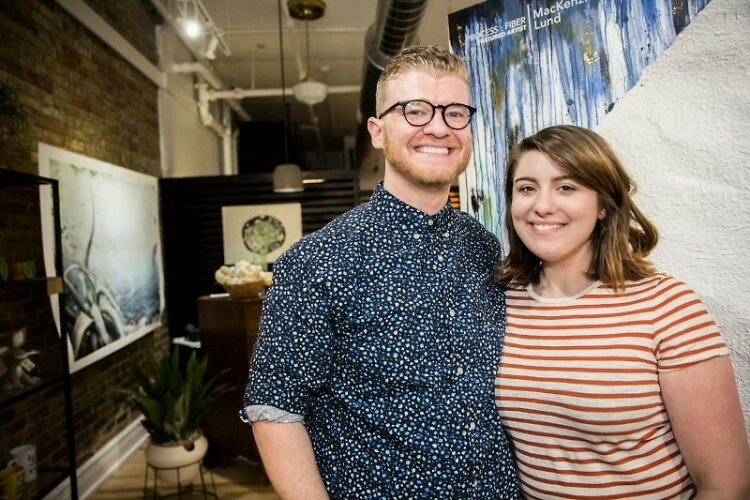 With their first year of business and ArtPrize under their belt, Owners and Curators: Erika Townsley and Matthew Provoast sat down to talk with me about the shift of the American Dream, what it means to be young small business owners, and how home is much more than just a place to sleep but a place to make your own. After graduating from Kendall College of Art and Design of Grand Rapids, Townsley and Provoast saw an opportunity to make their own hours, strengthen their community involvement, and become a source of support and retail for fellow local artists. Dwelling Place proudly supports the local artist community here in Grand Rapids, with almost 40 artist live/work spaces located along the South Division Corridor. Dwelling Place opened Martineau Apartments back in 2005, offering 23 affordable, two-bedroom, open floor plan apartments to those with a practicing art form. Shortly after, Kelsey Apartments added another 13 artist apartments. The artist live and work spaces open the door to residents taking ownership of how they want to activate their space and involvement in the community, having the freedom and tools to do so. “For the younger generation home is more of a moldable, shifting thing. It’s more reflective of wherever I’m meant to be at this point," says Townsley. Townsley and Provoast are active members in the community through photography and art, the neighborhood association and listening sessions, organizing donation opportunities during the holiday season at their storefront, and Avenue for the Arts First Friday events and planning. The Center for a New American Dream envisions "... a focus on more of what really matters, such as creating a meaningful life, contributing to community and society, valuing nature, and spending time with family and friends." “Our age group, mid twenties to early thirties, seem to be more focused on curating our own spaces and finding those little bits and ways of expressing ourselves," says Provoast on how shaping your own home expands to more than solely home owning. As the younger generations continue to shift to an entrepreneurship and community frame of mind, it builds the local economy and acts as tangible focus of community building through the relationships made in place making in the arts. Get involved with Light Gallery + Studio through their workshops, free First Friday events, shop at their storefront for local holiday gifts, and stay informed on future events by visiting their website and Facebook.